Could the old MacGyver meet the new one? 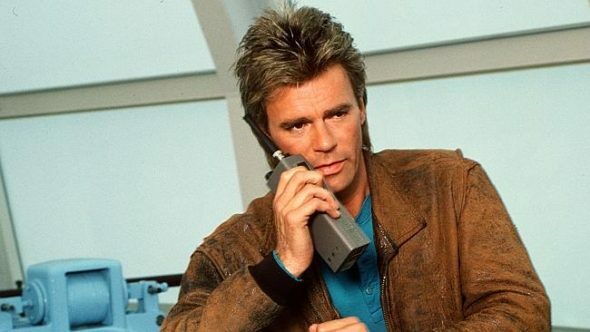 Deadline reports the producers of CBS’ upcoming MacGyver reboot want original star Richard Dean Anderson. Anderson played the skilled agent on the original ABC series from 1985 to 1992. CBS’ MacGyver reboot stars Lucas Till as a young Angus MacGyver. At this year’s Comic-Con, the series’ co-creator Peter Lenkov said they are trying to cast some of the original show’s cast members. As of now, Anderson has not been booked on the reboot, which debuts this fall on CBS. What do you think? Are you a fan of the original MacGyver? Would you like to see Anderson on the reboot? More about: CBS TV shows: canceled or renewed?, MacGyver (1985), MacGyver (2016), MacGyver (2016): canceled or renewed? Yes!! Anderson and till should work together to find the elusive father. Perhaps they could work as father and son searching together for their father and grandfather? Deffinatly could be a professor or someone mac consults for info. Mentor type. Please bring him back as a grandfather. So disappointed that this would be the “young” Angus M. Only workable arc is for RDA’s son Sam, to have another Angus, RDA’s grandson. Yes, they want to delve into M’s past – can certainly still be done as the new Angus looks at scrapbooks, films, videotapes, etc. The concept would be workable if the new McGyver was the son of the original. Then you could have guest appearances of the original with no re working the story. Or the original could start out the series as telling the story of his beginnings in a flashback. It would be more plausible that it was his grandson, because at the end of the original series he left the show with his son for a trip. That would make more sense. Only RDA can ever be MacGyver! But if the new series must go on, have RDA involved with it and on the show as a regular. MacGyver will forever be one of the greatest series of all times. Do not mess it up w/o having him in it. Yes please have Richard dean anderson on the new reboot we loved watching MacGyver so good today’s kids would love it. It’s way better than video games . He believed that non violence was good . Staying in school was important,and sciences are worth the time. Kids and camping are fun. Sports are good for all. I never saw the original, but always heard good things. I love Richard Dean Anderson from Stargate: SG-1, so I would love to see him again, even for just a brief appearance.